Hallel was excited. She was going to donate her long hair to make a wig for a child with cancer. So this morning at 8:50, way too early for a summer-vacation morning, I set off with Hallel and a few small kids to the closest hairdresser who volunteers his services to cut hair for Zichron Menachem. A few of my daughters have donated hair in the past through a different hairdresser. The other hairdresser was very professional and happy to help, but was pretty blasé about the whole donate-your-hair thing. But when we walked into the salon of this morning’s hairdresser, I was surprised by the hairdresser’s gushing excitement. Then he turned to me: “I have cut more hair for Zichron Menachem than any other hairdresser, probably in all of Jerusalem! I did one haircut for them yesterday, and I have two today.” I noticed his list of substantial prices on the wall. The time he volunteered cutting hair for the cancer wigs was costing him many hundreds of shekels a week. This hairdresser struck me as a person who loves his work—the snipping and the dying and the layering. But it was obvious that this mitzvah, cutting hair for Zichron Menachem, was his passion. We went to my bank next door to pick up my new ATM card. I was tired and wanted to get home, and was sure this additional errand would take me half an hour, tops. Weird. I don’t remember the last time I had to spell my name in English in Israel. Now this was getting even weirder…Why would she need my social security number? And for the next HOUR I sat there with a grouchy baby and a bouncy 3-year-old and a bored 6-year-old while Orna tried to figure out how to deal with this new computer program for the W9 that would not budge. Orna, who was lovely and helpful and as frustrated as me, called this one and then that one and then finally a manager came downstairs to set everything right. The mitzvah hidden within a wasted morning. When I saw this photo, I identified with it strongly. This photo is my life. The fog, so much fog, and so thick. On JewishMOM.com I talk a lot about the cosmic drama that we JewishMOMs create. You changed a diaper, what a chesed! You are pregnant, you are like Hashem Himself, creating new life! You fed a child, bathed a child, dressed a child—what a mitzvah! The angels are dancing! The way I talk, you would think that as I go about my daily life caring for my kids and for this house, that I am on a spiritual high. But I’m really not. Not at all. Most of the time, I’m in that fog. I don’t see Hashem. I don’t hear Hashem. 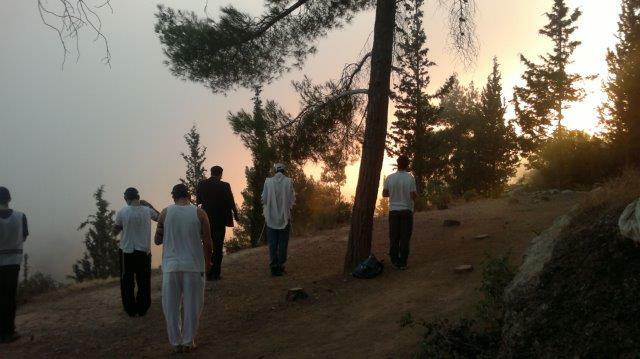 I don’t feel Hashem, anywhere. Because serving Hashem as a JewishMOM doesn’t usually feel like that hairdresser gushing with excitement. More often, it feels like the hour-and-a-half spent at the bank. 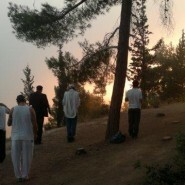 Suddenly seeing a trace of Hashem’s smile peeking out from behind the haze. chana jenny! yet another beautiful writing. you touch hearts each time. may you go from chayil to chayil! Thank you again, for a beautiful post! Really enjoyed this post:) thanks! Amazing! You managed to summarize what most women are feeling in a beautiful way. May your fog lift often and easily! Chana Jenny, can you tell us where to go to donate hair? I’ve never even heard of this, but it seems like such a wonderful way to do chessed!